Speed Ferries ticket reservations, ferry timetables and passenger information for Speed Ferries sailing to and from the ferry port of Dover and the ferry port in Boulogne France. Booking Speed Ferries tickets has never been easier, compare all Speed Ferries prices in real time and book the cheapest available Speed Ferries tickets to and from the ferry port of Dover and the ferry port in Boulogne France online with instant confirmation. Travelling by Speed Ferries is a quick, easy and stress free way to get there and back again. Book you Speed Ferries car or passenger ferries tickets with us and enjoy more choice and flexibility. With the latest Speed Ferries crossing information and timetables for all ferries sailing to and from the ferry port of Dover and the ferry port in Boulogne France including information on the ferry ports and useful tourist information about the destinations our detailed route and city maps will help you plot your Speed Ferries ferry journey. If are travelling by car, with your family or as a solo foot passenger book a ferry crossing with Speed Ferries and arrive at your destination refreshed, relaxed and happy. Speed Ferries offers fantastic fares to and from the ferry port of Dover and the ferry port in Boulogne France ferry ports. Book Speed Ferries tickets to and from the ferry port of Dover and the ferry port in Boulogne France online in advance at Ferryto.co.uk and you will always enjoy our cheapest available ferry ticket price. The price you see is the price you pay. There are no hidden extras or surprises such as added fuel surcharges or booking fees and we do not charge you anything extra for paying with a Visa Electron card. The price we quote you for your selected Speed Ferries route, onboard accommodation and vehicle type is all you will pay, and that's a promise. To obtain a Speed Ferries ticket price and book your ferry ticket securely online please use the real time ferries booking form on the left. Speed ferries Limited have now ceased to operate services between Dover and Boulogne. 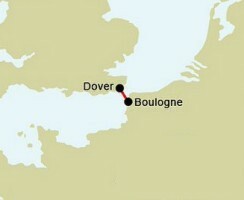 Previously SpeedFerries offered a fast ferry service between Dover and Boulogne taking just 50 minutes to cross the Channel. Speed Ferries offered up to 10 sailings and offered an alternative to the standard Dover-Calais route. SpeedFerries was a low cost ferry operator which started in May 2004 and continued in business until November 2008. It operated one route between Dover in England and Boulogne in France. It had only one high-speed ferry, called SpeedOne. Speed Ferries fast ferry service between Dover and Boulogne takes just 50 minutes to cross the Channel. Speed Ferries offer up to 10 sailings at and great value prices and offer a great alternative to the standard Dover-Calais route. With exclusive port facilities in both Dover and Boulogne, SpeedFerries customers also benefit from a less congested experience due to no freight or heavy traffic. Just a 30 minute drive from Calais, Boulogne has excellent motorway links and is ideally situated for travel throughout Europe. Speed Ferries is a ferry service between Dover in the UK and Boulogne-sur-Mer in France. The service commenced in May 2004 and is operated by a single ex-Australian navy catamaran. Their pricing structure is based around the concept of providing cheap travel for those travellers that book early with the price increasing the closer to the travel date. When the company launched, they started a price war amongst English Channel operators and forced other companies such as Sea France, P&O Ferries and Eurotunnel to reduce their prices. Speed Ferries used the banner "fight the pirates" for this campaign. The company only operate a single vessel. This leads to a period during the year (usually March) when no sailings occur and general maintenance is carried out. Best Price Guarantee - We always offer you our lowest available Speed Ferries ticket price and there are no hidden extras or surprises such as added fuel surcharges or booking fees and we also we do not charge you anything extra for paying for your ferry ticket with a Visa Electron card. The price we quote for your selected Speed Ferries car or passenger ferry ticket, onboard accommodation and vehicle type is all you will pay for your ferry ticket, and that's a promise! In the unlikely event you find the same all inclusive Speed Ferries ticket cheaper in the brochure of any other tour operator we promise that we will do our best to beat that price or offer you the choice of requesting a refund. To book Speed Ferries tickets please click here. Discounted Group Travel with Speed Ferries - Ferryto.co.uk offer a dedicated personal and affordable Speed Ferries group and coach party ferry passenger reservation service offering you the lowest available ferry rates. Our specialist Speed Ferries group travel team will secure the best deal for you and your passengers. The only requirement to qualify for discounted group travel ferry rates is that your party should be at least ten people and travel at the same time. For more information about group travel on Speed Ferries please click here. Ferry Logistics offer a personal and affordable Speed Ferries freight and cargo ferries reservation service to and from the ferry port of Dover and the ferry port in Boulogne France. In addition to offering preferential rates to commercial operators and haulers Ferry Logistics is now also able to offer discounted ferry freight rates to private customers such as those wanting to take transit vans on any of the Speed Ferries routes serviced. For more information and an instant online quote for your commercial vehicle ferry crossing please click here. At ferryto.co.uk you are able to obtain live Speed Ferries ticket prices, check availability, view ferries timetables and book Speed Ferries car and passenger ferry tickets at our lowest available ticket price. Ferryto.co.uk is part of the world's largest online ferry ticket distribution network providing the ability to book over 80 major European ferry operators including with Speed Ferries to over 1,200 ferry routes throughout the UK, France, Spain, Ireland, Holland, Eastern Europe, the Mediterranean, the Baltic and North Africa. Choose Speed Ferries ferries for the cheapest ferry ticket prices to and from the ferry port of Dover and the ferry port in Boulogne France.